Here's a guide to the decisions you will want to make about the look and feel of your Touch Wood ring. And we're always happy to talk about your ideas and answer any questions you have. Getting the right size for a comfortable fit is the most critical part of your custom order. We recommend that you get your ring finger sized by a reputable jeweler. Size the finger you are going to wear the ring on, not the opposite hand. Get it done twice! Please get sized for the same width of ring sizer as the ring you want David to make for you. Narrow and wide rings will fit differently. If you are using a ring to get a measurement, be sure the jeweler is using a metal mandrel (not a plastic mandrel). A mandrel is the cone shaped tool used to take a ring size measurement. A plastic mandrel is not reliable as a sizing tool. Try on some different rings. When you find one that's perfectly comfortable, note the width and thickness of the ring, get it sized; design your wood ring with that one in mind. Remember too, a wood ring is warm, not subject to temperature changes the way a metal ring is. And, there is no weight to a Touch Wood Ring, a very different experience to wearing gold or titanium or silver. For your own ring, we recommend that you have your finger measured at least twice. Measure once during normal temperatures early in the day, and once at the end of a long day. Please remember that the wider your ring is, the tighter it will fit. Again, we recommend you try some rings on and see what feels comfortable. 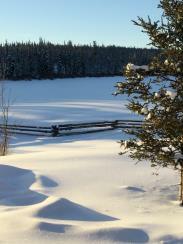 Don't rely on a measurement of cold fingers, as this is when fingers are their smallest. Please note that we can only guarantee we will build the size you order. You must guarantee that it will fit! David is however, able to resize most rings to some degree. What style of ring do you like? You might use the reference numbers from our gallery pages to describe a ring you like. Or, you could copy/paste pics of rings you like from our website or blog, or provide a written description or even a sketch. Consider the profile of the ring you want; flat, rounded, half round etc. Decide what type or types of woods you would like your ring to be made from. If you choose woods that we feel do not match up well, we'll steer you in a better direction. Go ahead and play with designs - colour outside the lines! We're here to help! We have a page of information that might be of interest to you if you want to consider the mythic or spiritual qualities of the woods you are choosing. 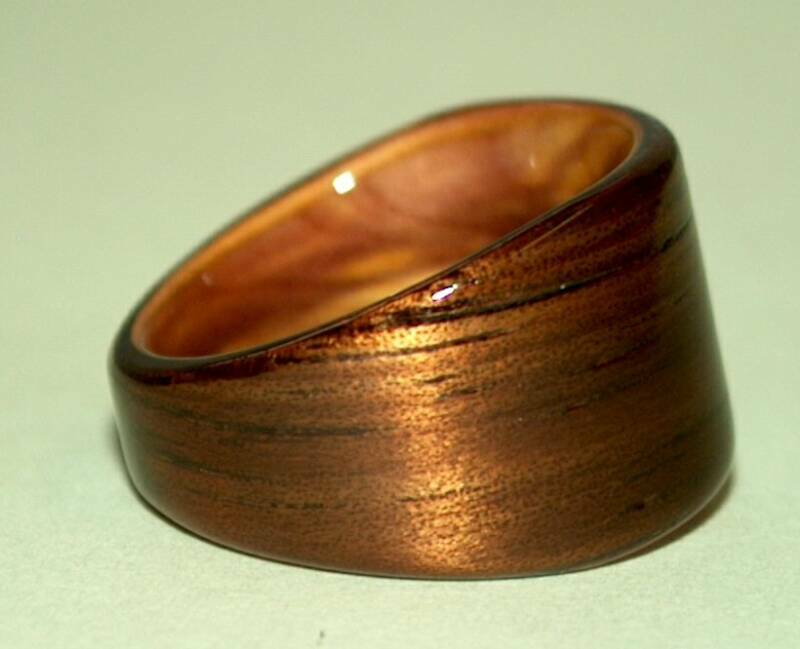 You might consider your skin tone when deciding on light or dark woods for your wood ring. Consider your preference for obvious or subtle wood grain? 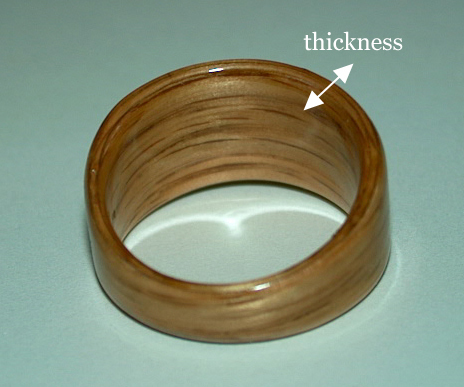 Your preference of a wide or narrow band - keep in mind the types of activities you are likely to be involved in while wearing your wood ring. If you like a wide band (6mm or more) we strongly suggest you consider having it tapered since tapering will protect your wood ring from coming in contact with heavy or sharp objects you might be handling. A tapered ring can still look like a full ring when it is worn. David does what we call a 'hidden taper' or a more obvious 'full taper'. How thick a ring do you want? Do you like the feeling of a substantial ring on your finger or would you rather not know it's there? Have some fun at a costume jewelry counter - try different rings on and see what's comfortable. Your budget is a consideration of course. We charge for our work according to how much time and effort goes into a particular style or type of ring. Every ring is an individually hand crafted custom piece commissioned by and created especially for you. 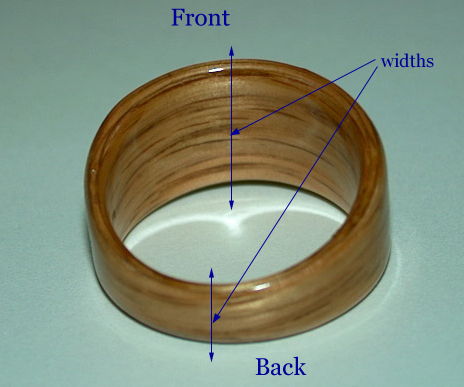 The cost of your Touch Wood Ring depends on the complexity of your design. The types of wood you choose have very little bearing on the price of a ring. A commissioned Touch Wood Ring starts at $450 Cdn. As of September 2016, $450 Cdn is about $340 US. We use xe.com as a reliable currency converter. We will quote you a set price just as soon as we have worked out the details of your custom design. Remember there is no rule that says you have to spend any money on a ring ~ we have linksto instructions on how to 'make your own ring' and we particularly like the traditional Finnish birch bark ring. Your timeframe and our schedule - When you first contact us, please let us know if you have a 'needed by' date and we'll let you know our schedule and our next available shipping dates. David is often booked a few months ahead but please contact us if you want a ring in a very short time frame as are sometimes able to accommodate a more urgent request. Thanks. I like to have the time to get to know you, and David likes to spend a month with each ring he creates. Even the simplest ring requires at least 8 hours of individual attention as well as a certain number of days and weeks for the finishing, drying and curing processes. We book folks in a particular month when their rings are going to be created and they are finished by the end of that month. Special Requests We are always happy to discuss special requests however David does not engrave, carve or draw on the exteriors of his wooden rings preferring to allow the natural beauty of wood to draw it's own designs. For the most part inlaid bands need to run in continuous and straight lines but can of course be spiraled, cross spiraled and set in different widths. Inlaid bands can also be made of crushed stone or crystal but we do not work with gold, silver, platinum or diamonds. An Inscription? - We can do that! Our inscriptions are meticulously hand written in fine point ink or pencil before the final finish is applied. If you would like something inscribed on the inside of your ring please let us know. Inscriptions will not work on a very dark wood interior and look best on a lighter and smooth grained wood. to send us an inquiry and we're always happy to answer your emails too! Copy/paste images from our site or social media if that helps you describe what you like. What is it about the design and the woods you've chosen that appeals to you? Colours, figure, qualities of the woods? And, any comments or questions of course. by British Columbia artist and craftsman David Finch; pioneer of the bent wood ring.